Should our music be 3D or 2D? We know that spatial delivery of sound design is critical, but does that extend to the music? Do most listeners care if the music is 3D? It’s vital that we keep listener impact in mind – and some scholarly studies from expert researchers can help us throw light on that subject. Measuring galvanic skin responses, a study conducted at the University of Hull in the UK tested for emotional reactions to both spatially treated music and standard stereo music recordings. They found that spatial treatment had no effect on the emotional impact and enjoyment of music. So, using a traditional stereo mix for a VR game’s music isn’t necessarily a bad thing… but spatial positioning for music can be beneficial, and fun too. We can use 3D elements to help integrate a 2D musical score into the VR world. We can use 3D music to grab the player’s attention. We can have music transition from 2D to 3D for dramatic effect. 3D music elements can help the musical score feel better connected to the environment in VR. Let’s take a look at an example from the Fail Factory VR game, which demonstrates how 3D music elements can share the stage with a conventional stereo music mix. In this comedic video game, players go to work in a zany robot factory. Players build massive robots, while keeping up with the ever-increasing complexity and speed of the assembly line. The result is often a series of hilarious failures, inspiring the game’s name – Fail Factory. When Armature Studio hired me to compose the music for their Fail Factory game for the Samsung Gear VR, they described a project in which music took center stage. By necessity, Fail Factory is set on a gigantic factory floor – but what makes this factory uniquely awesome is the musical nature of the environment. All the machinery in the factory moves rhythmically with the musical score. So, the dev team asked me to create a jazzy score for this music-driven gameplay. Apart from the score, all of the sound design of Fail Factory is also created specifically to be musical. The bleeps and bloops are pitched to integrate with the score, and the bangs and clangs are timed to emphasize the tempo. While much of the music is delivered to the player in traditional stereo, there are also lots of separate rhythmic and pitched elements that are spatially positioned on the game’s factory floor. The sound design team and I worked hard on getting the balance right between these 2D and 3D components. So you can see that 3D music and audio in VR can be a complicated issue. While the majority of the music in Fail Factory is mixed in stereo, there are percussive and tonal components (such as that big clang) that are spread out in 3D across the VR space. These elements in 3D allow us to have a nice stereo music mix that also integrates well into the three-dimensional soundscape. Now let’s take a look at a different example that shows how music in VR can transition from 2D to 3D for dramatic effect. We’ve just explored what it means to compose music with both 2D and 3D considerations in mind. The next article will focus on the second of the three questions: whether music in VR should be diegetic or non-diegetic. Thanks for reading, and please feel free to leave your comments in the space below! This lecture presented ideas for creating a musical score that complements an immersive VR experience. 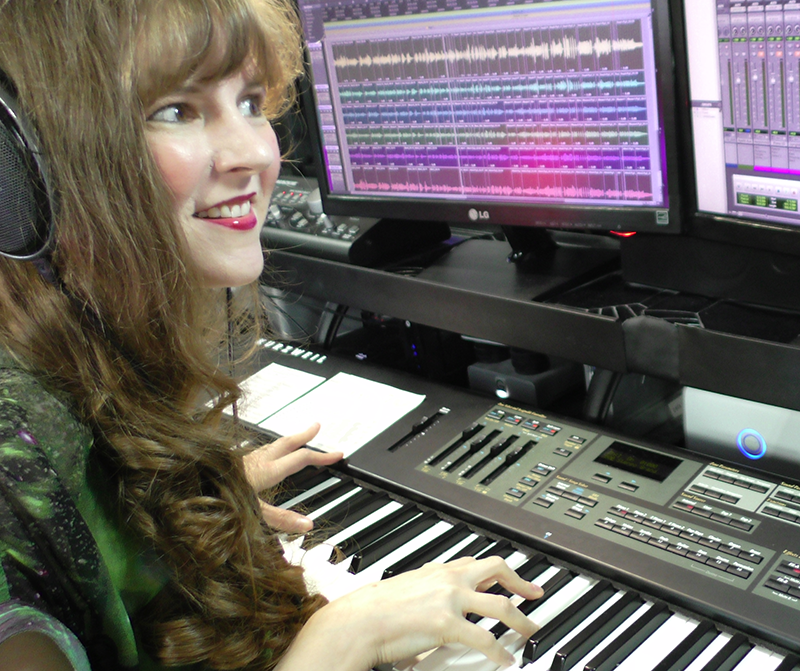 Composer Winifred Phillips shared tips from several of her VR projects. Beginning with a historical overview of positional audio technologies, Phillips addressed several important problems facing composers in VR. Topics included 3D versus 2D music implementation, and the role of spatialized audio in a musical score for VR. The use of diegetic and non-diegetic music were explored, including methods that blur the distinction between the two categories. The discussion also included an examination of the VIMS phenomenon (Visually Induced Motion Sickness), and the role of music in alleviating its symptoms. Phillips’ talk offered techniques for composers and audio directors looking to utilize music in the most advantageous way within a VR project. Through examples from several VR games, Phillips provided an analysis of music composition strategies that help music integrate successfully in a VR environment. The talk included concrete examples and practical advice that audience members can apply to their own games. The talk was intended to be approachable for all levels (advanced composers may better appreciate the specific composition techniques discussed). This entry was posted in Conferences, Game Audio, Game Music, Music Composition, Virtual Reality and tagged 3D Audio, Game Composer, game developers conference, GDC, positional audio, video game composer, video game music, virtual reality. Bookmark the permalink.